This was posted on January 2, 2018 by Sarah Maxwell. Mary, Anna, and me with our newest sister-in-law, Chelsy Maxwell! You all look so beautiful. I hope everyone had a great time at the wedding and reception. Thank you! Yes! The wedding and reception were wonderful! Beautiful!!! Can’t wait for more! What beautiful ladies! I love the color of the bridesmaid dresses. I was able to watch the entire wedding as it was live streamed on Saturday. Such a Christ-honoring ceremony. I’m very happy for John & Chelsy, and will look forward to seeing more photos. Blessings to all of you! The colors did turn out amazing! Rehearsal day pictures coming tomorrow! Sweet picture of you girls. Thanks again! Thanks for coming to the wedding! Enjoyed talking with you! Such joy for all! Ladies you are all so beautiful! My favorite color! Love it! So enjoyed joining y’all by livestream. All of you ladies look lovely. The teal is such a good color for you. The wedding was very nice and Chelsy and John look very much in love. I agree–the teal was an amazing color. Yep! Those two are very much in love! Beautiful picture! All of you look so pretty. I do love the teal, very flattering color. What a beautiful wedding!! I know quite a few others have commented….but that blue-teal color is amazing!! Very beautiful ladies! Thanks! Chelsy picked out the colors and dress! I love how simply elegant you all are and modestly dressed! Congratulations! Everyone looks lovely! The color and style of dress looked great on all of you. Hope they were warm, too! I have been following your family’s blog and was able to catch the wedding livestream from Singapore…430am sunday morning (gulp!). Enjoyed it lots! Yes the dresses are beautiful…even the young expecting moms look great in them! 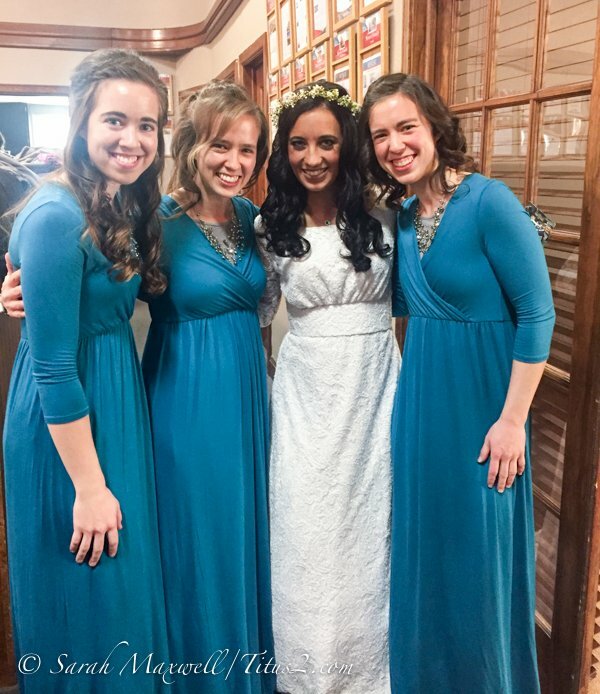 Chelsy worked hard to find dresses that would work for her expecting bridesmaids too! I know this’ll probably sound hum-drum with all the other comments, but the color of those dresses is one of my absolute favorite colors!! You’re welcome! It’s my joy. Y’all look so beautiful! Congratulations to John and Chelsy. Those dresses are very flattering on yall! Definitely wear them again! Chelsy did a good job finding dresses, and even in the color she wanted for 14 bridesmaids! What georgous dresses, and pictures, may God bless their beautiful life together! Thanks! It was so special.